Garador Guardian Range Secured by Design steel garage doors with new lock protection, an anti-snap cylinder, high security bracing and improved lock. 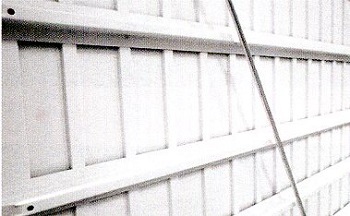 Canopy or retractable mechanism available on this high security, secured by design, up and over garage door. Manual version only. Cannot be made electric for security purposes. 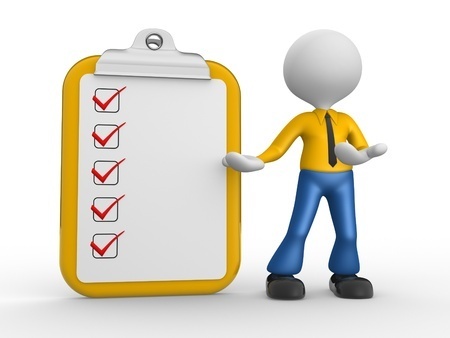 The secure by design certification gives peace of mind, maximum security and, in certain cases, reduced home insurance cost. 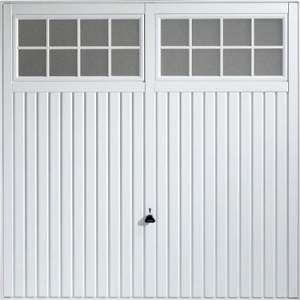 A low cost, high security garage door. Horizontal or Vertical rib design in White powdercoat finish, as standard. Other colours available, on request. 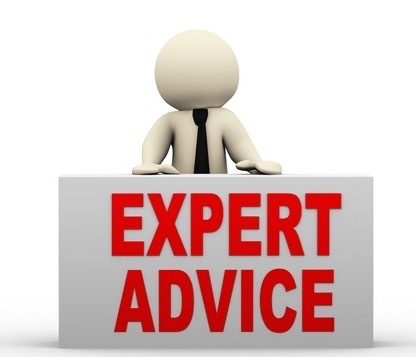 The SBD certification states that these doors must only be installed via a steel fixing frame, not a timber one. 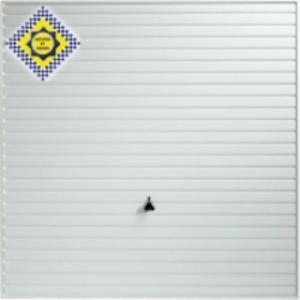 Garador Guardian range of up and over garage doors. The Secure By Design STS 202 accreditation is achieved by any construction product, including garage doors, which withstand an attack using certain tools over a given period of time. The doors are currently available in Horizontal Rib, Vertical Rib and Salisbury design in canopy or retractable mechanism. Standard sizes and made-to-measure available (Salisbury design in standard sizes only). 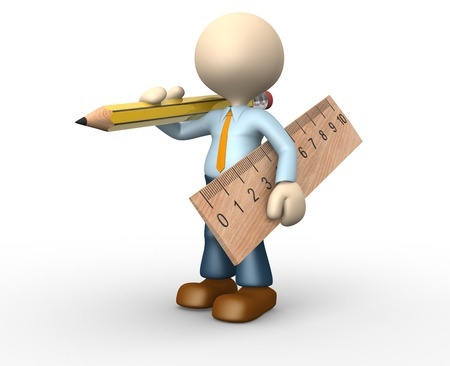 Send us your sizes using our easy-to-use self measure up form and we will advise and answer any specific questions you may have. 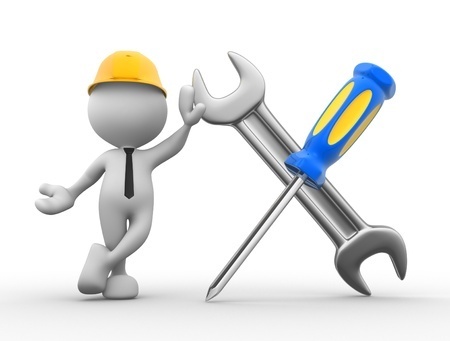 Other Secured By Design doors by Arridge Garage Doors Ltd are Hormann Insulated sectional garage doors, which, when fitted with a Hormann Promatic or Hormann Supramatic automation kit, also achieve Secure By Design accreditation. 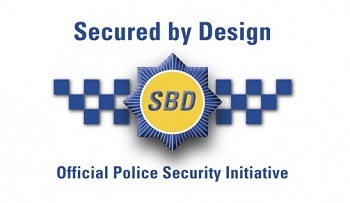 Secured by Design official logo. The first up and over door available in the UK with full “Secured By Design” accreditation (STS 202 Issue 3: 2011 BR1). When security is important, this is the ideal door. If the door lock is attacked, forced or levered the front section of the Eurocylinder, being sacrificial, will fall away. 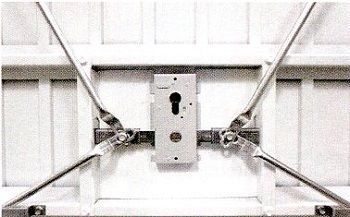 The inner part of the lock, which remains securely locked if such an attack takes place, remains in place below the surface of the door and is very difficult to get to. Steel Plate Protection of the Lock Body. If an attempt is made to force or cut through the metal door skin adjacent to the door handle, a sturdy metal plate welded behind the lock protects against such an attack. 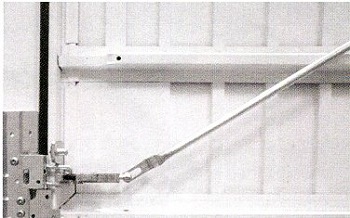 The plate also protects the locking rod anchor points where they are connected to the main lock body. Rather than having the standard 2 horizontal steel bracings welded to the rear of the doors, 8 are now used. If, in the extremely unlikely event of someone “peeling” the steel skin off the front of the door, a person could not climb through the small spacings between the bracings. If a burglar attacks the corner(s) of the door and attempts to pry a corner open, steel reinforcement plates prevent distortion of the door or access to the corner latches. 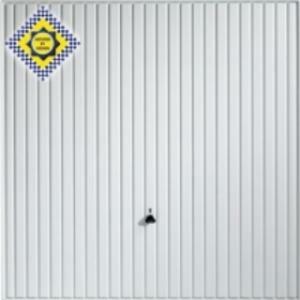 All Guardian doors are supplied with a factory-fitted steel goalpost fixing frame. This is much stronger and more resistant to attack than a door mounted to a timber goalpost frame which can splinter or crack. Fixings are also easier to force out of timber. Steel security bolts, rivets and welds are used on the Secure By Design door.